If your player is simply looking to "try" the sport, a great low-cost option is VLC's Holiday Break Clinics. These two-day clinics for boys and girls on December 27-28 allow players to "try" lacrosse without the investment of all the equipment, and new players get a FREE stick with their registration. Just go to camps.veronalacrosse.com for more details. If you are already past just trying the sport, and are looking for additional information on lacrosse and/or how to outfit your player for the spring season, some of the links below should be helpful in that process. 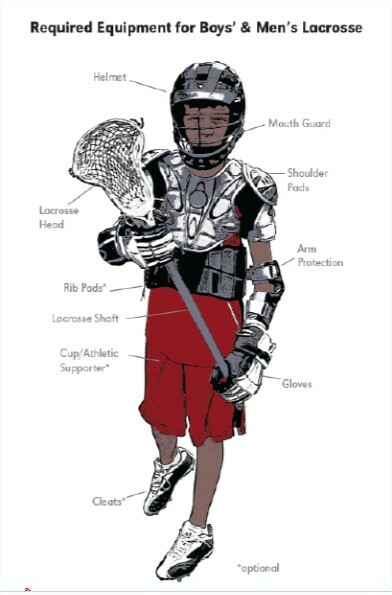 Having the right gear and equipment that fits will make for a more enjoyable experience while learning the game of lacrosse. Another great place to learn about equipment needs and to get your questions answered is the VLC youth information meeting, scheduled for Tuesday, January 22, 2019, at the Badger Ridge Middle School from 6:30-8:00 pm. This is a great place to learn more about the sport, Verona Lacrosse Club, and equipment outfitting. And, of course, in the meantime, if you have any questions, just contact the applicable Youth Director. Played by two teams, players work to get the ball into the opposing team’s goal, and the team scoring the most goals by the end of the game, wins. During play, players use crosses (sticks) to pass, catch, and run with the lacrosse ball. The goalie is the only player allowed to touch the ball with his hands. Field positions for a boy’s lacrosse team include a goalie, three defense players, three midfielder’s and three attack players. Field positions for a girl's lacrosse team include a goalie, three defense players, five midfielders, and three attck players. The goalie must prevent the other team from scoring, protecting the goal at all times. Defense players help defend the goal and the goalie and they typically stay on the defensive ‘3rd’ of the field. Midfielders play defense and offense, playing the entire field, which requires stamina and speed. The attack position involves scoring goals and working with the other attack and midfield players to pass the ball to score goals. Like defensemen, attackmen typically stay on their side of the field. Much like hockey, there is a list full of equipment need to play boy’s lacrosse. All players on the field, with the exception of goalies, are required to wear a helmet, shoulder pads, arm pads, gloves and a mouth guard. Each piece of equipment comes in a variety of styles and brands which allows players to find gear that best fits their preferences but can also make the buying process confusing. Thankfully, when it comes to equipment for beginners, the pads comes relatively standard between brands. There are a few differences between brands of starter equipment, but as you’re going through the buying process it is important to keep in mind your budget and your child’s level of interest in the game. Look for helmets that are NOCSAE certified. Your helmet is arguably the most important piece of equipment in your lacrosse arsenal. Comfort is the most important factor. The main difference between helmets is weight, field of vision, and fit. It is important that the lacrosse helmet fit snug to your head to limit injury. Most helmets in the game today offer unique ways of adjusting the helmet size so you can customize it to fit your head. Lacrosse helmets have air vents to increase air flow and decrease its weight. All helmets come with an adjustable chin strap for added protection. Helmets can also be customized to match your team’s colors or add personal flare to your game. VLC places a clubwide helmet order each year, which are usually suitable for most grades due to adjustability. Learn about helmet sizing. The protective equipment designed for young players just learning the game comes relatively standard across brands as they all keep 1 goal in mind, keeping your young athlete safe. To fully outfit your player you will need to pick up a pair of gloves, arm pads and some shoulder pads. All beginner equipment will work for players at any position on the field so you will not need to worry about specific gear for midfielders versus defensemen and so on. The biggest difference in beginner gear lies in the price as single pieces of equipment can range from $14.99 to $49.99 so you will want to focus on your budget and the level of interest of your kid when investing in this equipment. Additionally, you can often find "starter packs" that contain all of the protective equipment and sometimes a stick too at reduced price, and these "starter packs" are usually a low-cost way for your player to learn the sport of lacrosse. There are hundreds of options and combinations of lacrosse sticks on the market, which is why we recommend focusing on the complete stick offerings for your youth players. As the name suggests, complete sticks come with a shaft and strung head together making them game-ready right out of the box. Although defensemen in the game of lacrosse use longer sticks than offensive players, it is important to outfit your young athlete with a stick that fits their size as you could imagine it is very difficult to learn the game when you can hardly handle your stick. Most youth coaches will recommend taking the stick, putting the head at your child’s feet and measuring up to their belly button then cutting the shaft down to meet that height. This will help them handle the stick with ease and ensure a positive learning experience. Since you will be modifying this piece of equipment, it is important to take note of your child’s size and your budget as they could very well outgrow their cut down youth stick in a season or two. Unlike every other field player, the goalie is only required to wear a helmet with a throat guard, gloves, a protective cup and a chest protector. Similarly though, this equipment comes relatively standard between brands so again you will likely focus more on your budget when making your buying decision. Although there are gloves specific to the goalie position, at the beginner stage, they are not required. Goalie gloves comes with reinforced protective around the thumb making that part of the glove generally stiffer. This could make it hard for a young player to use these types of gloves so as an alternative, younger goales may want to consider sticking to regular youth gloves. VLC provides goalie sticks for youth teams so there isn't a need to purchase a separate goalie sticks. But, if you do want to buy a goalie stick, there are not many complete stick options for goalies so you will likely need to purchase a head and shaft separately. Goalie heads are unlike any others on the field as they are much wider and do not have any restrictions in game when it comes to the depth of the pocket. When buying these pieces, we would recommend focusing on strung heads and entry level shafts as you will also need to adjust the length of the shaft depending on your player’s height. There is significantly less equipment required to start playing girl’s lacrosse in compared to boy's lacrosse, which will make the buying process much easier. 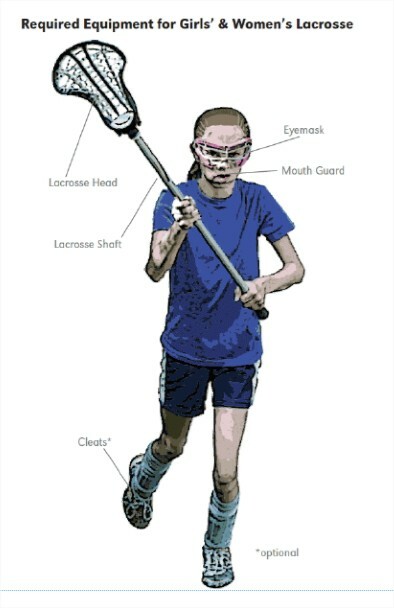 Essentially, your young athlete will need three items to hit the field: a stick, a pair of goggles and some cleats. Thankfully it is more common to find women’s lacrosse sticks come as complete sticks rather than separate heads and shafts. When you get to the elite level, there are different widths and styles of lacrosse heads meant for different positions on the field, but for youth players we recommend finding a head that has a wide face shape so there is more area to catch and scoop the ball. Even if your young athlete requests an elite level stick, it’s important they master the fundamentals first. Most youth complete sticks will come with an alloy shaft and likely in a 7/8th inch diameter which is smaller than the 1 inch diameter of men’s sticks. Both diameters can be used with women’s lacrosse heads, but the 7/8th inch is recommended for youth players so they can get a better grip on their game. All complete sticks come in a standard size, so you will want to measure the stick with the head at your child’s feet up until their belly button and cut down the handle to fit. Having a shorter stick will make handling it more manageable and ultimately more fun when they play the game of lacrosse. Similar to the boy’s game, the goalie in the girl’s game is required to wear a helmet with a throat guard, gloves and a chest protector and will use the exact same equipment. Similar to boys youth, VLC provides a goalie stick for youth girls teams. If you want to purchase a goalie stick, a few manufacturers do make goalie equipment specific for women, but that equipment is meant for older and more elite level athletes. So, the same equipment suggested for youth boy’s goalies will apply for youth girl’s goalies.